The P0300 trouble code indicates that one or more cylinders are experiencing misfires. A misfire is an event when an insufficient amount of fuel is burning in a cylinder. 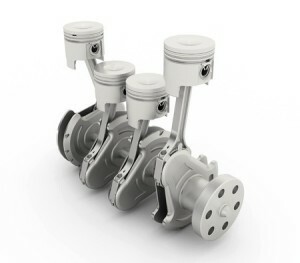 The efficient burning of fuel in the combustion chamber is essential to engine operation, as the energy release from the burning, or combusting of the fuel, is what provides the energy to power the engine. In case of major misfires, the power contribution from that cylinder may be negligible and result in noticeably less power from the engine. As a result, the other cylinders having to work harder to meet the power demand from the driver, which will in turn also negatively impact fuel consumption and gas mileage. In addition to these negative reactions, there is also the possibility of overheating the exhaust and melting the catalytic converter. A melted catalytic converter would introduce significant backpressure, which could cause engine damage. Aside from the light on the dash indicating a problem, other symptoms could include a ticking sound from the engine, reduced power, increased fuel consumption, and a stronger than normal hydrocarbon odor. The noise is easier to detect at idle when wind noise is not interfering with the engine noise. The odor is also much easier to detect in idle conditions, and especially when walking outside the car. The reduced power may also be detected at idle, as the engine can begin to sputter and have difficulty holding normal idle engine speeds when it is not receiving normal energy contribution from all cylinders. Reduced power may also be noticed during accelerations. During cruising it is more difficult to detect reduced power, since maximum power is normally only used during accelerations. The P0300 error code can have many different root causes, but the most common cause is in the ignition system. The ignition system provides a spark to the cylinder that allows the gasoline to combust under pressure. As the ignition system ages, the delivery of spark to the combustion chamber can degrade. As this system ages, the spark delivery can become inconsistent or absent completely, resulting in misfire. Other possible causes could be due to insufficient amounts of fuel, excessive amounts of air, or mechanical issues. To fix the issue, I would recommend reviewing any accompanying failure codes that indicate which cylinder is having the issue. The next step would then be to start inspection of the ignition system, hopefully on a cylinder specified by a different failure code. If an accompanying failure code is not present, then check the voltage going to each cylinder to see if the issue can be isolated. Next, begin to visually inspect for any signs of wear or corrosion that would prevent the normal transfer of electricity. Check the spark plug, ignition coil, ignition cables, and distributor for any abnormal signs and replace as needed. If the ignition system has been thoroughly inspected and no issues were found, begin to look for any components that could impact fuel flow (filter, pump) or air (EGR valve, Mass air flow, air filter). If any of the parts are found to be suspect, replace as needed. Engine misfire issues, such as error code P0300, can be a difficult problem to pinpoint and troubleshooting can test your patience. If all of the checks above have been attempted and the issue is not yet resolved, it may require that you take the car to your local mechanic or dealer to discuss. Do not change any parts that you are not comfortable with and risk causing more damage to the engine than was present in the first place.